Visit the Witch Doctor Market of Acapulco and its astonishing and unbelievable diversity. Take a dive into the Mexican history and culture by visiting Palma Sola, the only archaeological site in Acapulco, located in the amphitheater or high part of the port, particularly on the slopes of Cerro El Veladero. 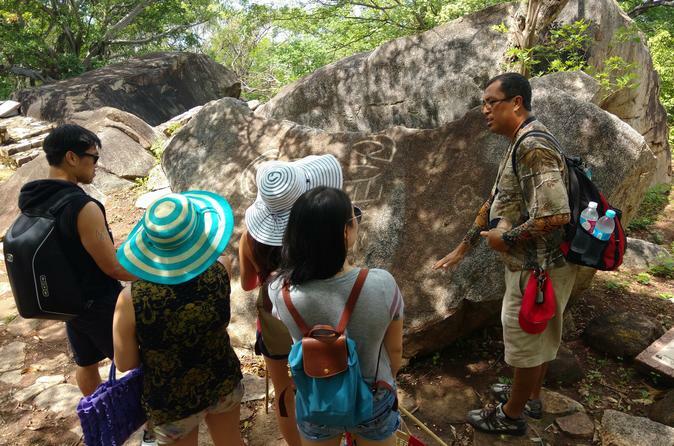 It consists of a set of 18 granite rocks of various sizes with engravings depicting the way of life and the geographical environment of the place that was inhabited between 800 a. C. and 750 d. C.
Your knowledgeable and reliable tour guide will pick you up at the lobby of your hotel. Once on board the excursion, you will drive up the hills of Acapulco learning about the lifestyle of the working class of Mexico, and general information about the country. After a visit to Palma Sola that will not last less than one hour and a half, the tour will head to the Mercado Municipal: a really eye-opener! This large Mexican market is fascinating. There will be so much to see—dry goods, housewares, gorgeous flowers, candy, live roosters, fresh produce and much more. Many stalls feature health care products, which were a combination of herbal remedies and Santeria like - Witch Doctor - type spells and prayers to saints. One of these stalls has a cage full of large live bugs and animals whose purpose you´d prefer not to ask about. After the market, your friendly guide may stop in a place for you to have lunch (not included) or you will be taken back to your hotel.